Without Amazon launching Kindle in Japan, publishers would have continued to digitize at a snail’s pace. TOKYO: On October 24, Amazon finally announced the official launch of its Kindle in Japan, and the shipment dates of four of reading devices now supporting Japanese language. Devices on sale include the Kindle Paperwhite (Wi-fi version priced at ¥8,400 or $104; 3G at ¥12,800) and the 7″ Kindle Fire (standard version for ¥12,800 and the HD for ¥15,800. These devices go on sale on November 19th and December 19th respectively. As for the availability of Japanese titles, Amazon claims, modestly, to offer “tens of thousands of a wide variety of books including newly published best-selling titles and comics” and “more than ten thousand free books including Japanese literature classics.” October 24th was, perhaps not coincidentally, also the date that Apple announced its much rumored iPad Mini. In Japan, the launch of Amazon’s e-reading platform has been rumored repeatedly since 2008 and reported by major newspapers since early 2010 with changing dates — Q4 2010, Q1 2011, year end 2011, spring of 2012, etc. People have been waiting with anxiety, one might even say dread, as the arrival of the Kindle would mark the true beginning of the “era of open, digitized publishing” in Japan. Amazon likely learned a lesson from Rakuten/Kobo’s botched launch a few months ago, which ended with users disappointed and frustrated by technical troubles and the poor availability of titles, both in quality and quantity. With Amazon, we can assume a few challenges have been met: 1) the testing of Wi-Fi/3G connection with the new Kindles has been completed; 2) Japanese-language functionality with Mobi/KF-8 have been verified; and 3) the availability of a certain number of Japanese titles has been assured. Network connectivity has never been a problem, even with Kindle 3, and all the Japanese-specific functionalities are already defined clearly by the W3C and the IDPF (as HTML5/CSS3 and EPUB3 standards respectively) and implemented as WebKit, which is available for use by Amazon for those who need reliable translation from EPUB. As of October 25th, Kindle listed 71,403 Japanese language titles. Of these titles, 10,146 having been uploaded in the week prior — numbers that are close to those of Sony Reader Store and Kobo. It is unlikely that Kindle will be able to compete on title selection alone. Amazon’s competitive advantage likely lies with its great and reliable user experience, one that is similar to that available with Kindle worldwide. Features such as as multi-device support, simultaneous checking of availability in different formats (print, digital, used), an effective search engine and integration with Amazon.com will likely impress people enough for them to forgive the glaring absence of a vast number of valuable titles that should be there. The problem with the limited availability of titles is that Amazon will take much time to resolve this issue and Kindle won’t be able to outdo its rivals in terms of available titles any time soon. 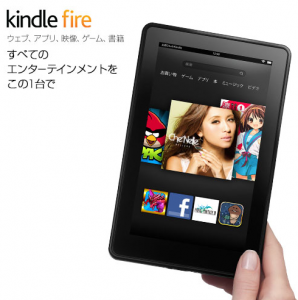 So, why exactly did Amazon launch its Kindle in Japan now? The key reason for the launch of the Kindle is not to do with e-reading, but with the ecosystem built on Kindle Fire, which provides access to global content (e-books, manga, apps, games, videos) as well as other goods. This is something Amazon could not delay any longer. Unlike its rivals, Amazon sells paper books and secondhand books and is already the largest bookstore in Japan of these formats. Naturally, they care about their customers’ satisfaction, and once Kobo arrived Amazon’s customers demanded the Kindle. Without the Kindle as motivation, reluctant publishers would continue to digitize at a snail’s pace. In “the chicken or the egg” situation, the chicken must come first in Japan. The existence of the world-class e-bookstore will push publishers to get up to speed. Structurally, the book market is different here. Manga is the mass market product that provides the most profit, while trade and academic books have very long tails. Amazon knows the market, better than local competitors, and must be developing specialized approaches optimized for each segment. But they couldn’t do so without opening the Kindle store first. Some of the corporate services, such as Whispersync for business and schools, require the publishing infrastructure to go global sooner rather than later, and without regard to the marketability and profitability of each country. Overseas publishers also see the desirability of a global platform, one that enables an alternative approach to the difficult market, one that combines such elements as multi-language publishing, digital first, and print-on-demand. If Amazon is to be a partner in their globalization efforts, Japan has to be part of that equation. A frequent contributor to Publishing Perspectives, Hiroki Kamata is the editor and publisher of E-book 2.0 magazine. DISCUSS: Is Being First Into an International E-book Market Ever Best?